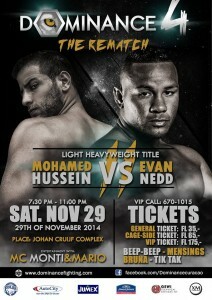 November 29 2014 the rematch between Mohamed Hussein (Curacao) and Evan Nedd (Aruba) will take place at Dominance 4 "The Rematch". The fight will be for the Light heavyweight (84-93 kg) belt MMA Pro-rules. The fight card will consist 7 MMA fights and 3 Thai-kickboxing fights. The co-main event will be MMA pro Jose Borrome (Venezuela) vs Jean-Marc Howell (Aruba). One of the other MMA fights is also a rematch, David Hawker (Attaf) vs Tico Lynch (Undisputed Soldiers). In Thai-kickboxing there will be also a rematch between local heroes Grego Scharbaai (Baas Sports) and Olando Raply (Thai Flying Dragon). There will be also two International Thai-kickboxing fights, David-Lee Winklaar (Bonaire) vs Jamel Craigg (USA) and Thierry Goeloe (Curacao) vs Lawrence Irons (Aruba). Friday night October 31 there will e a press conference. A big event like Dominance would never be possible without the support of sponsors and for this reason extra attention for those sponsors. AutoCity offers services in sales, leasing, parts and garage of the very best automotive brands, including: Chevrolet, Honda, Isuzu, Subaru, Suzuki and AC Delco. Check out their new rides at their showroom! Centrally located in the bustling heart of Curaçao's Otrobanda, lies the Howard Johnson Plaza Hotel. This 3-star hotel is perfect for a comfortable, affordable and memorable stay at a world-famous historical location. GEWI Technical Services N.V. is a local leader in engineering advise and the leasing of large metal structures for wide variety of applications, ranging from construction to entertainment events. Polar Beer is synonymous of quality and fun. A full-bodied Pilsener beer glowing more than gold and cooler than the North Pole. Live the most anticipated fighting event while enjoying a refreshing Polar! Jumex offers a wide and delicious variety of juices and nectars, manufactured with prime fruits, pasteurized, non-added colorants nor conservatives to bring the best quality and freshness. X-Treme Media is a young and dynamic enterprise, focusing on graphic designs, advertisement and social media. Their flagship project vinepapiamentu.com is the largest Facebook community page in the Dutch Antilles. Tickets are available at Bruna, Mensing, Beep Beep, Tik Tak and Baas Sports.